Earlier this month, we shared our Olympic Watch Party. Frozen hot chocolate is a fun cocktail to enjoy while watching the games. We love the idea of a hot chocolate bar with different toppings such as whipped cream, chocolate squares, caramel sauce, chocolate syrup, cherries, etc for your guests to enjoy. 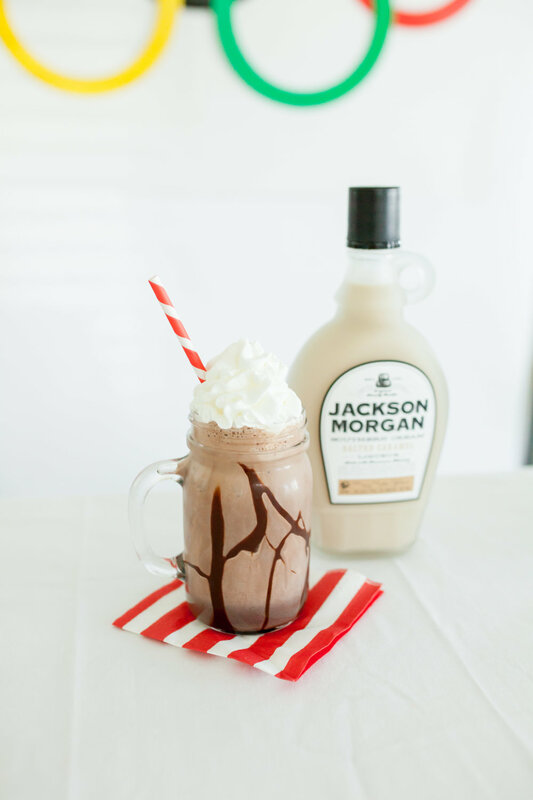 In a blender, add the Jackson Morgan, milk, hot chocolate mix, and two cups of ice. Blend well. If needed, add the rest of the ice until you have the right consistency. Pour chocolate syrup around the inside of a chilled mug. Then pour the frozen hot chocolate into the mug. Top with whipped cream, enjoy.